The crew of International Space Station Expedition 53 is gearing up for three spacewalks beginning this week to complete major maintenance on the Mobile Servicing System including the replacement of a grappling mechanism on the robotic arm to ensure the Station’s vital asset for capturing visiting vehicles, moving large equipment and transporting spacewalkers remains in good health into the last decade of ISS operations. The three spacewalks are set for October 5, 10 and 18, each planned to start around 12:05 UTC and last approximately six and a half hours. Expedition 53 Commander and veteran spacewalker Randy Bresnik will serve as the lead spacewalker for all three EVAs, to be joined by Flight Engineer Mark Vande Hei for the October 5 and 10 excursions and Joe Acaba on the third EVA on the 18th. 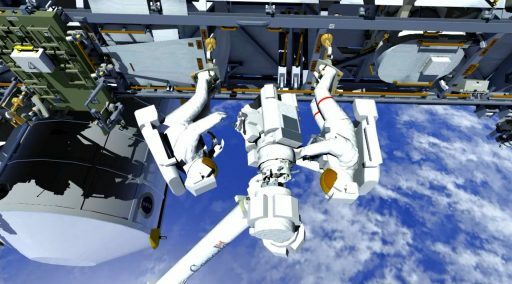 The objective of the first of the three spacewalks will be the replacement of Latching End Effector A (LEE-A) on the Space Station Remote Manipulator System (SSRMS) which has shown increased degradation including motor stalls. 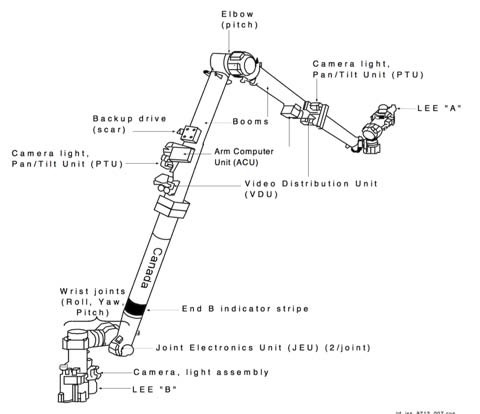 The two subsequent EVAs will be dedicated to lubrication of the new end effector to ensure smooth operation of Canadarm2’s moving parts with additional EVA tasks being the replacement and installation of external cameras on the Station’s truss and the Destiny laboratory as well as minor external reconfigurations to prepare for future work. The 17.6-meter long Canadarm2 has become an absolutely indispensable tool for the International Space Station Program as it fulfills a number of critical functions that include the capture and release of visiting Dragon, Cygnus and HTV cargo spacecraft, installing and handling external payloads and other components, assisting in spacewalks by moving equipment or astronauts, and maneuvering the two-armed Dextre robot for external maintenance tasks that would otherwise require a spacewalk. 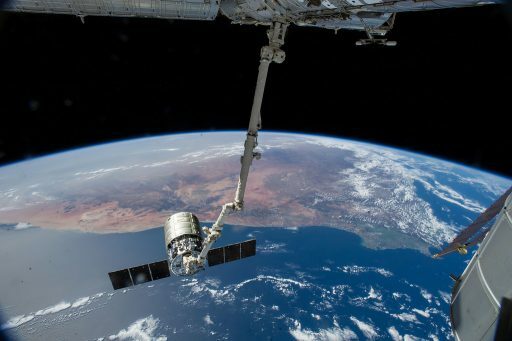 Now a central part of the Station’s ability to function at its present capacity, there is great desire to keep Canadarm2 in working condition and avoid any risk of ISS losing its prime robotic asset. 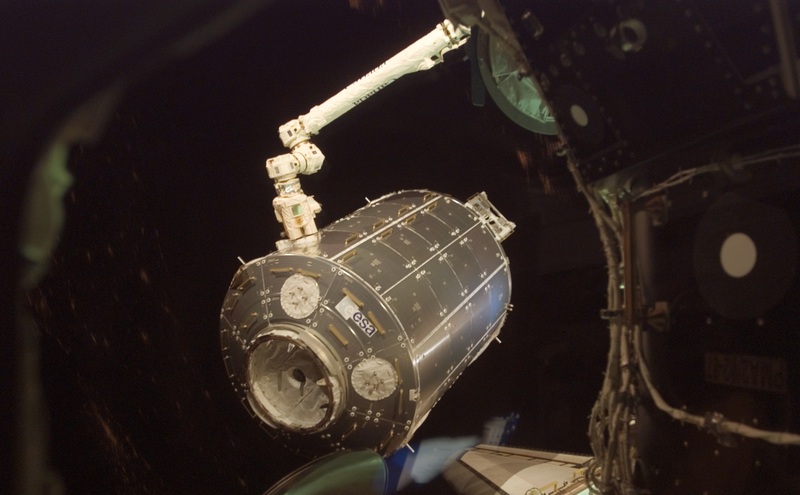 As a larger and more advanced version of the arms flown on the Space Shuttle, Canadarm2 was delivered to the Space Station by the STS-100 mission of Shuttle Endeavour in April 2000. The arm has seven motorized joints (an elbow hinge in the middle and three rotary joints forming the wrist/shoulder ends), allowing the arm to move items in seven degrees of freedom (much like the human arm but with a larger range of motion). Its two Latching End Effectors (LEEs) enable the arm to self-relocate between the different Power & Data Grapple Fixtures installed on the outside of ISS and the Mobile Base System allows the arm to traverse the entire length of the Station’s truss to reach its work sites. Weighing in at 1,800 Kilograms and measuring 35 centimeters in diameter, the arm is certified to handle payloads of up to 116 metric tons – a capability sized for the potential of having the arm assist with docking the Space Shuttle. 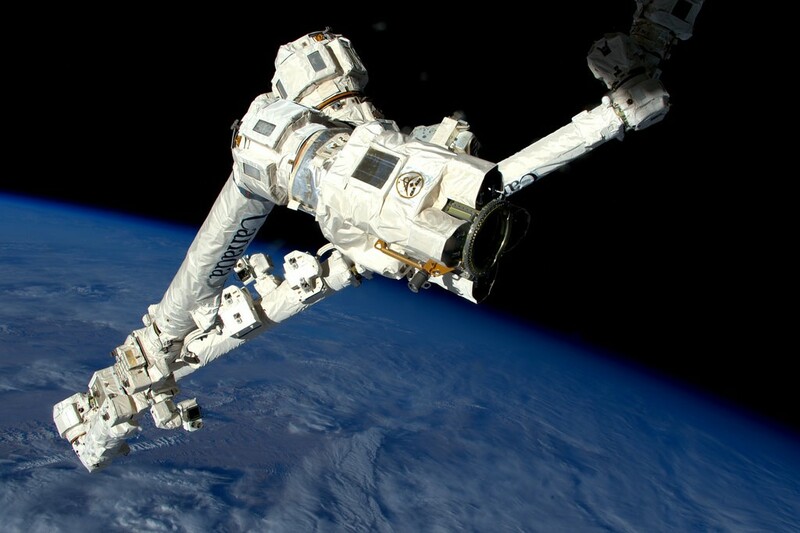 Canadarm2 grappled its first visiting vehicle in September 2009 when the first H-II Transfer Vehicle arrived at the Space Station, marking the first of 26 vehicle captures completed to date. Starting its tenure in the early days of ISS, Canadarm2 was controlled by crew members aboard the ISS Destiny module and played a major role in assembling the Space Station from installing large pressurized modules to assembling the 108.5-meter long Integrated Truss Structure. In 2010, robotic operators aboard ISS finally received an out-the-window view of their work as a second robotics control station was established in the ISS Cupola, delivered by Space Shuttle Endeavour. Over the years, the capabilities of the Station’s robotic duo, Canadarm2 and Dextre – a Station resident since 2008, grew from being operated by crews onboard ISS and supporting EVAs to completing maintenance activities under ground control, thus freeing up valuable crew time that would otherwise have been spent operating the robots or venturing out on EVAs. Canadarm2 and Dextre showed off their talents early this year when completing the major ground work for the replacement of a dozen batteries on the Station’s S4 truss segment, cutting the number of spacewalks required by the crew from six to only two excursions to complete dexterous tasks like connecting cables. 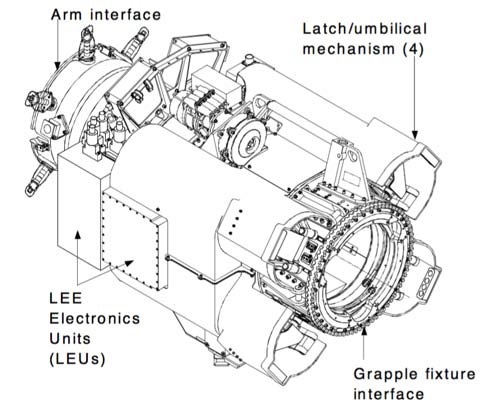 Degradation on the arm became evident in recent years through telemetry from the two Latching End Effectors and efforts were made through spacewalks starting in 2015 to prolong the life of the two LEEs by lubricating their moving parts after data showed higher current draw when the latches were actuated. 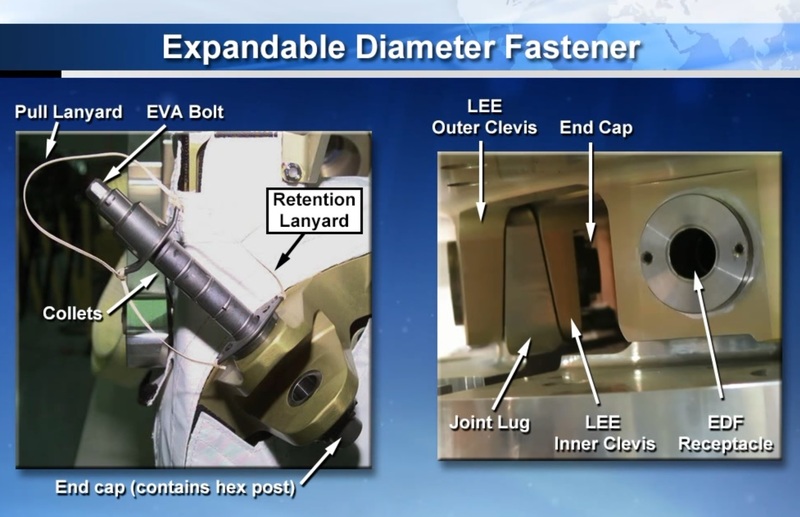 Latching End Effector A was lubricated by Astronaut Terry Virts in February 2015 and LEE-B by Scott Kelly in October of that year with Dextre beginning lubrication of its LEEs earlier this year. Given the fact that both LEEs worked well beyond their planned 10-year life times and from the growing wear and tear on both of them, it was clear that replacement would be needed at some point in the 2017/18 time frame. 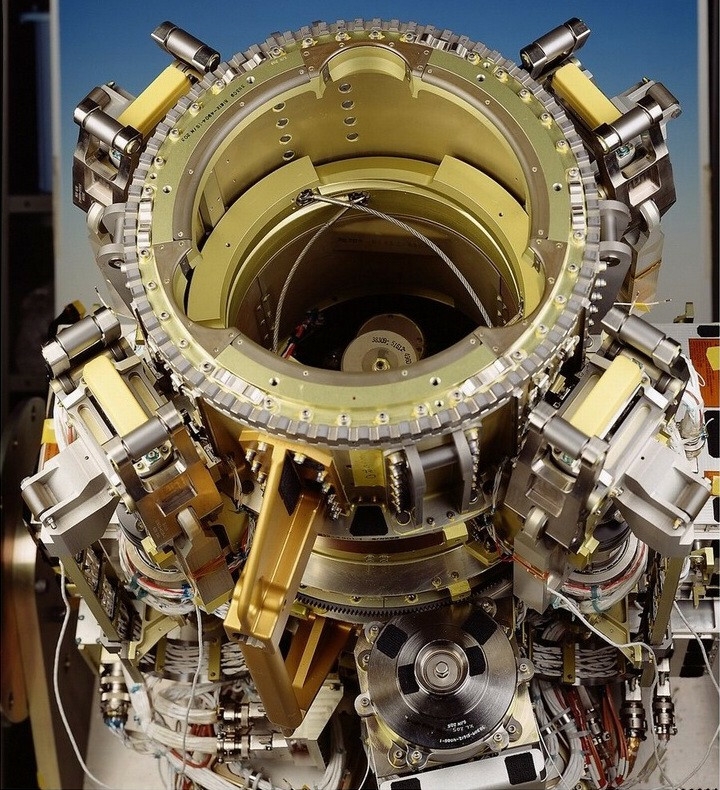 LEE-B was earmarked to be replaced first given its degradation appeared more severe than that of LEE-A and preparations for the replacement EVAs began in July 2017. 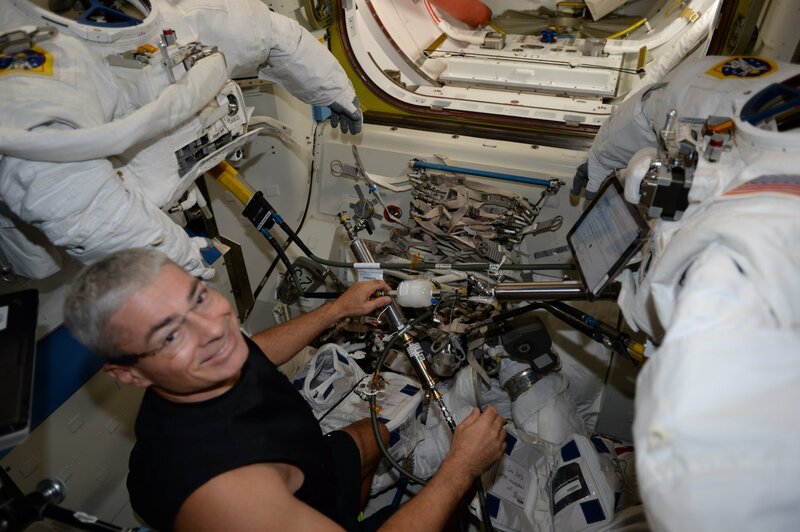 On August 22, 2017, ROBO controllers were in the middle of walking the robotic arm to the Mobile Base System in preparation for the replacement of a Remote Power Control Module that had tripped open and was unable to be closed. LEE-A failed to latch to the Mobile Base System and motor currents were on the high end as the latches were being driven. As a result, the RPCM replacement was called off for further study, though a survey conducted on September 13 showed no signs of obvious damage. The LEEs of the robotic arm, Dextre robot and Mobile Base System are among the most complex electro-mechanical systems on the Space Station, hosting a large number of actuators, avionics, force-moment sensors and each has a camera to provide guidance for robotics controllers. Each LEE weighs over 200 Kilograms and is a little over one meter in length, capable of being replaced by spacewalkers as Canadarm2 was designed to be fully serviceable in order to support ISS operations through the Station’s operational life. Personnel-wise, the U.S. Segment is in the advantageous position of having four crew members, allowing two to work as IV crew members and assist the spacewalkers before and after the EVA. 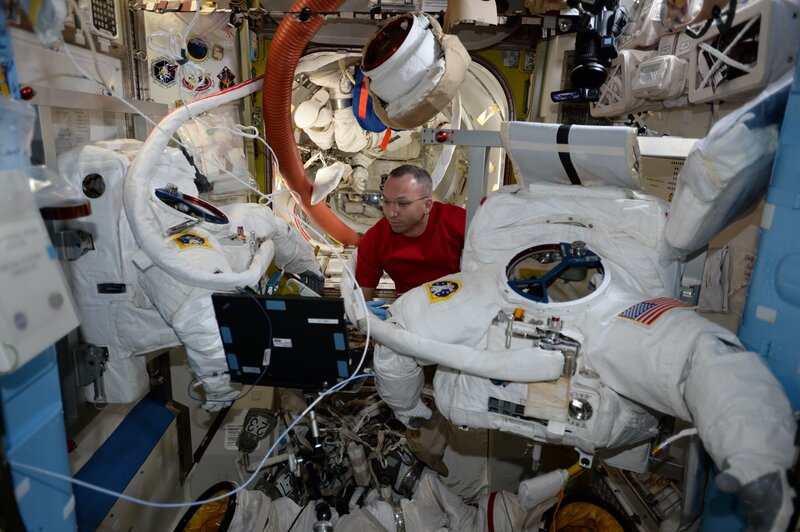 In use for all three spacewalkers are Extravehicular Mobility Units #3003, to be worn by EV-1 Randy Bresnik with red stripes for identification, and EMU #3008 to be used by Vande Hei and Acaba. 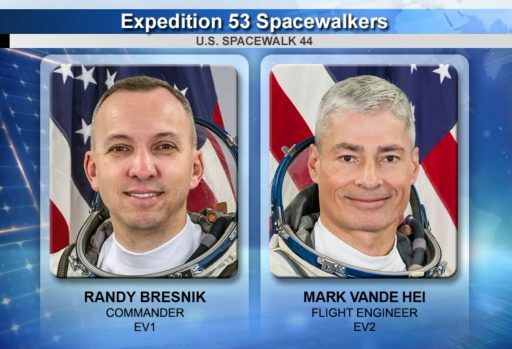 For Thursday’s EVA, designated U.S. EVA-44, third-time spacewalker Randy Bresnik and EVA rookie Mark Vande Hei will venture out of the Quest airlock with Bresnik carrying a tool bag and Vande Hei fetching a foot restraint on the way to the work site on the port truss of the station. 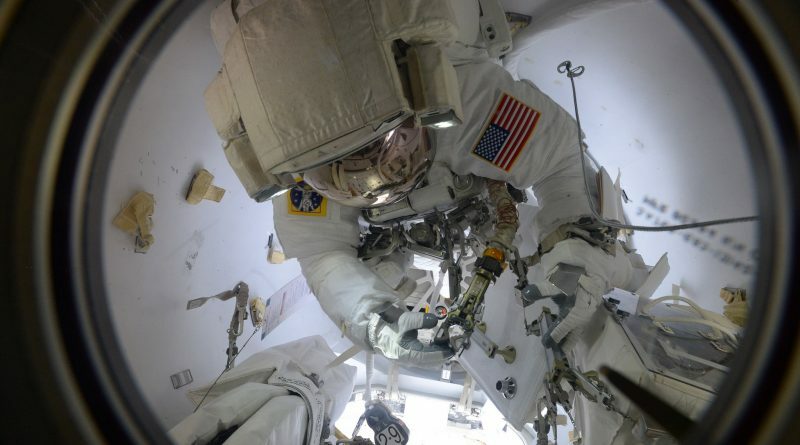 The spacewalkers will set up their portable foot restraints on Face 1 of the truss and then instruct ESA Astronaut Paolo Nespoli to maneuver LEE-A in a position between them to get started with the replacement. A pair of thermal and micrometeoroid blankets will be released to uncover the joint interface which hosts six Expandable Diameter Fasteners (EDFs) that hold the LEE in place. Two bolts will be released before the LEE will be rotated to allow the crew to access the remaining four. After the arm rotation and before the release of the four remaining EDFs, the arm will be powered down and a handling device attached to the LEE to allow it to be tethered prior to removal. The EDFs are one potential point of difficulty in this EVA. Their use on the SSRMS and its grapple fixtures was dictated by their high load requirements. The EDFs are fixed to the LEE and run through the LEE-joint coupling where they attach via a clevis-lug interface. Inside, the bolts click into an end cap with a hex post which enables the bolt to drive. When being driven via the Pistol Grip Tool, the length of the EDF decreases and collets within the interface are forced outward to create a friction fit with high rigidity and zero clearance. When all six EDFs are removed, the degraded LEE-A can be removed and will be temp-stowed on the CETA Cart (Crew Equipment Translation Aid). The spare LEE started its career as the POA LEE – Payload/Orbital Replacement Unit Accommodations, a temporary holding platform for payloads and pallets equipped with grapple fixtures, e.g. the HTV’s Exposed Pallet. Given its rare use, the POA LEE can be considered a viable spare for Canadarm2. At the POA, Bresnik and Vande Hei will again release the six EDFs to demate the LEE and then move it over to the robotic arm where they will first inspect the electrical connectors within the LEE and the arm joint before installing the LEE, in the process connecting the blind-mate connectors. Four EDFs will be driven to an initial torque before the arm is powered up to be rotated to allow the spacewalkers to install the remaining bolts and then drive all to torque. A series of engineering photos will be gathered before the two multilayer insulation blankets will be put back on. This will be followed by a series of diagnostics on the arm to ensure the LEE functions as designed while the spacewalkers will move the degraded LEE to be POA for installation via the six EDF bolts. 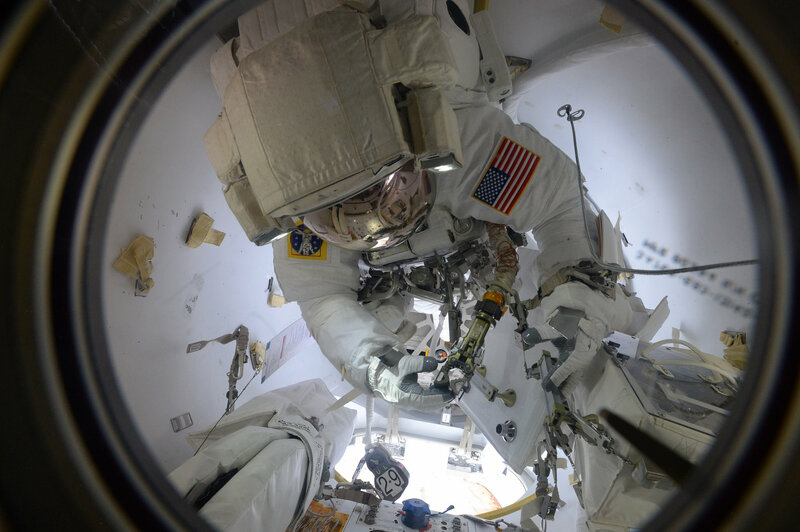 The duo will then close out the EVA in orderly fashion by stowing the foot restraints and going through a tool inventory before going back into the airlock. After working on a single task for the entirety of their first EVA, Bresnik and Vande Hei will be dealing with a number of objectives on U.S. EVA-45, specifically the rotation of a spare Pump Flow Control Subassembly on the Destiny lab to allow it to be vented on a future EVA, the replacement of a camera group on Camera Port 9 on the lower port truss segment, lubrication of the central ball screw of the new LEE-A, replacement of a camera lens on the Mobile Transporter, and the removal of two hand rails on the Tranquility module. 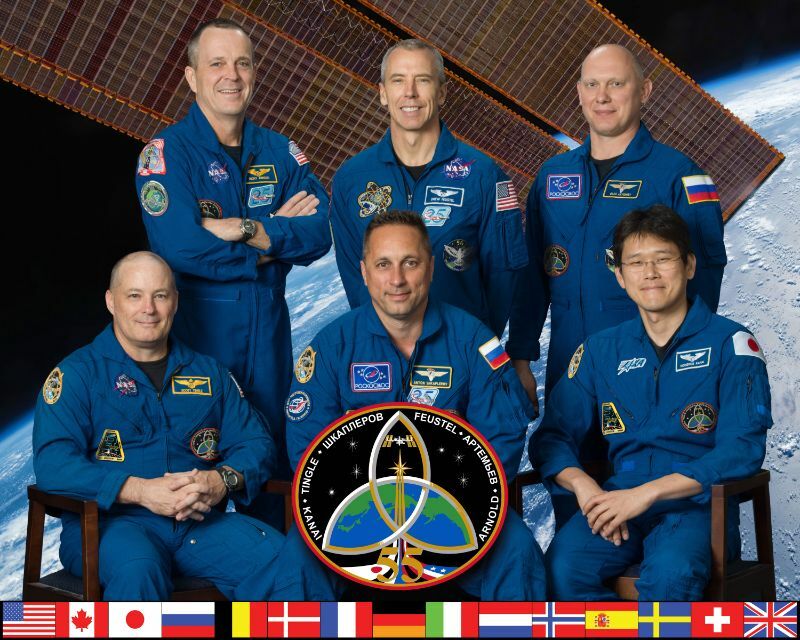 For EVA-3, planned on the 18th of the month, Randy Bresnik will be joined by Joe Acaba as EV-2 who has two career EVAs under his belt. 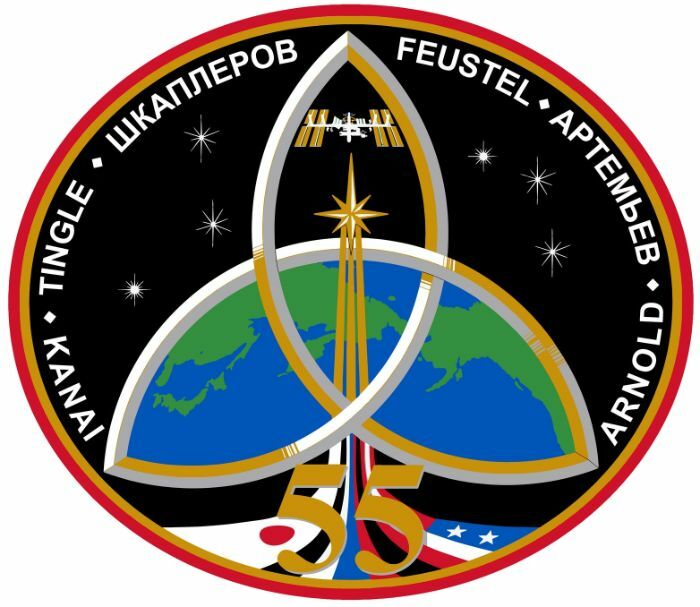 Per the EVA objectives – provided EVAs 1 and 2 go according to plan – Acaba will be tasked with the installation of a high-definition camera on Camera Port 3 and replacement of a camera group on Port 13 on the starboard side of ISS while Bresnik replaces a fuse on the Dextre robot and removes a cover from a spare Main Bus Switching Unit for future robotic manipulation. Next, Bresnik will remove a cover from a Direct Current Switching Unit spare and Acaba will be dealing with lubrication of the new LEE-A’s four latch screws, eight linear bearing tracks, and the equalization brackets & rollers. LEE-A will eventually make its way back to Earth on a Dragon for refurbishment and re-flight which will also provide valuable insight into where degradation progressed and how the LEEs being installed now can be preserved for longer lives either through more regular lubrication or operational changes. One pristine LEE spare is currently available on ISS, delivered by the STS-129 mission in 2009 and another ‘launch-on-need’ spare is ready to be flown to ISS.